Colour Ektachrome 35mm slide depicts a buddhist temple with stone sculptures as well as one golden statue of the garuda fairy tale animal. 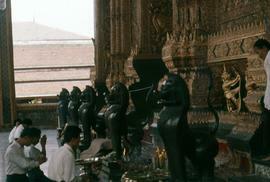 Colour Ektachrome 35mm slide depicts Buddhist worshippers sitting in a temple. Colour Ektachrome 35mm slide depicts a child sleeping in the shade on a stone statue. Colour Ektachrome 35mm slide depicts a close-up of a boat carrying produce making its way along a klong. Colour Ektachrome 35mm slide depicts a group of children standing on a platform that is part of a house. 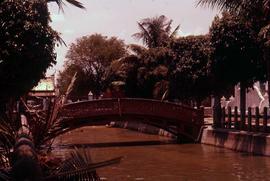 Colour Ektachrome 35mm slide depicts a klong with a lot of small boat traffic and houses covering both of its banks. Colour Ektachrome 35mm slide depicts a man holding a snake while a crowd of people, largely sailors in the Navy, watches in the background. Colour Ektachrome 35mm slide depicts a man on a boat selling various things ranging from chicken figures to pots. Colour Ektachrome 35mm slide depicts a man on a cart pulled by oxen being passed by another individual on a bicycle.